Milners safes were built to last and that is exactly what has happened. Many have now survived long past the company that made them. Many area still in use daily but just as many are found by new owners of property and sadly at the homes of deceased relatives. If you have a Milners safe which needs opening call Safecracker. 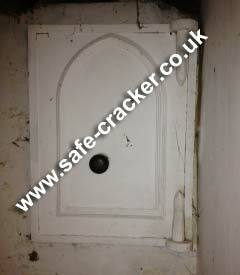 When the owners moved in to their new home, they found this Milners floor safe, fitted in to a wall in their cellar. As they were not able to open it, they called safecracker. We attended and quickly establish that the lock was already in the open position. From looking at the condition of the wall surrounding the safe and listening to the door as we tapped around it with a hammer, we were able to work out the reason that the safe would not open. We then used a safecrackers guarded technique to open the door. Once open we confirmed that the damp from the walls had caused the lockout, and because of the amount of rust there was, it had also rendered the safe as an uneconomical repair. If you have a safe that needs opening call safecracker. Remember a lock may not be the only reason your safe will not open. When the owner of this old Milners 212 safe lost the keys for it he called safecracker. We attended and opened his Milners 212 safe for him. To ensure that it continued to give another 100 years of service we even supplied a refurbished lock from our stock of old safe locks. 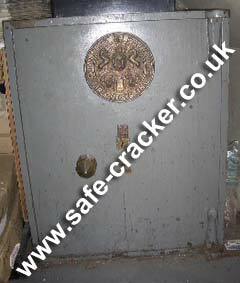 If you have an old safe which needs opening or need a part for an old safe call safecracker.